Jason Sadler doesn't know yet what his last name will be next year. It's going to the highest bidder. Call it crazy or call it ingenious, but 30-year-old entrepreneur Jason Sadler has cooked up another weird way to make money. Sadler, who lives in Jacksonville, Fla., makes a living wearing T-shirts. For a fee, Sadler will wear a sponsored T-shirt featuring a company's logo for a full day or an entire week. 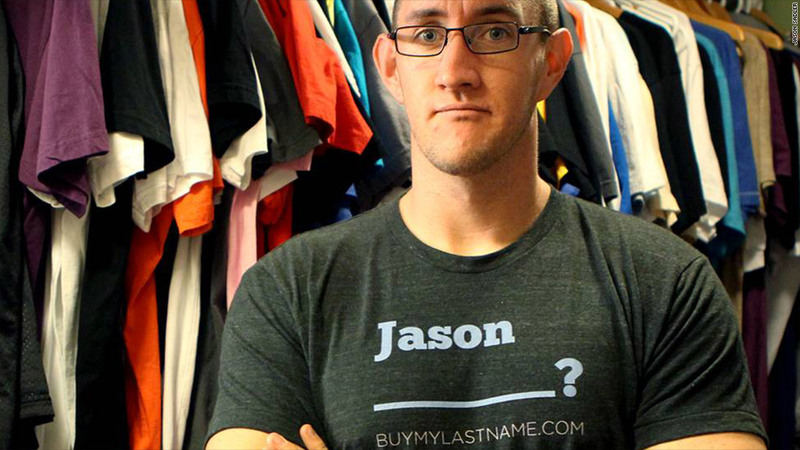 He calls his company IWearYourShirt and, of course, uses social media to get the word out about his latest clients. But like any small-business person, he needs capital. Which leads to his latest idea: He is holding an online auction and will legally change his last name to the name of any company that makes the highest bid. Sadler will adopt that company's name for all of 2013, starting on Jan. 1. He'll use the money he raises to invest in his startup. He launched the auction on buymylastname.com on Nov. 1. Within 24 hours, he had 19 bids. The auction ends on Wednesday. The current highest bid on the site is for $34,500 from JLabAudio, a maker of headphones and earbuds. "Sadler presented a unique opportunity to us that we felt could also generate a lot of buzz for our brand," said Win Cramer, general manager of JLabAudio. Sadler (his name for now at least) launched his original business in 2009 and leveraged Twitter, Facebook (FB), YouTube and Flickr to spread the word. That year, he wore a different sponsored T-shirt every day, Sadler said. "I'd make online videos wearing the T-shirts, just going about my daily life," he said. He also tweeted about the brands, wrote posts on Facebook and created a one-hour live video show on Ustream talking about his clients. "I wore a different T-shirt for 800 days straight. No day off," he said. By 2011, Sadler had hired five people and was logging $250,000 a year in revenue. His client roster included brands such as Starbucks (SBUX), Angry Birds, Nissan, Zappos and Pepperidge Farm. What do his social media followers think about his latest gimmick? "Some folks say that I'm selling out," Sadler said. "Look, I've sold the shirt off my back, literally. So this won't affect my life at all." Just to be sure, Sadler did consult with a lawyer and put some restrictions in place: "No pornographic name, religious names, political names allowed," he said. After all, his new name will appear on his driver's license, passport and other forms of ID for all of 2013. What would you do to raise money for your business? Did you find a crazy or innovative way to finance a startup? Email Parija.Bhatnagar@turner.com and you could be featured in an upcoming article on CNNMoney.